Conduct your next business or association meeting, conference or workshop at sea on a cruise ship. Your participants will love it and your Finance Department will be thrilled! For more information, call us at 877 836-1949, option 2 for a free event consultation or email or submit our request for proposal form. Why Choose Us? Because We Save Your Company or Association Money! Let's be honest, many companies and associations rely on support or administrative staff to plan and coordinate their business meetings, conferences and training programs. They may also take a stab at trying to develop their own incentive awards programs. All the while, they are diverted from the primary job they were hired to do. Many times costly errors or omissions are made in planning the event simply because they have never been trained in event managment. Save time and money and let the pro's do it for you. We know the tricks of the trade and pitfalls to avoid in putting together complex events with contracts and the myriad of penalties you can incur if you do the wrong things. Companies and Associations spend billions on corporate meetings in the U.S. every year, yet only a small percentage have this sizable but fragmented spend under management. An interesting statistic gathered from StarCite: 80% of meetings are planned in advance but account for only 50% of a company’s meeting budget. It’s those last-minute meetings, perhaps planned spur-of-the-moment, that eat away at half of a company’s program expenditures. Smaller meetings are generally sourced by non-professional planners (perhaps a secretary, administrative assistant or marketing coordinator at the firm). They are usually overlooked by upper management. There is no reporting, feedback or tracking of these smaller meetings and their attendee costs, so there’s no accountability structure in place. Because they are not sourced professionally, cost leveraging opportunities are missed (for example, the booking of multiple programs with one vendor, which often result in cost-savings, is not present). The shorter lead times leave less chance for cost comparisons, and ensuing negotiations. Under the gun, planners are forced to just accept what hotels or other venues offer to them. Planning, organizing and structuring a meeting, conference or workshop at sea on a cruise ship is significantly different than planning a cruise vacation or conducting a similar event at a land resort. Many meetings at sea have been ruined because they were booked by travel agents who did not have the knowledge or experience to know what to ask or what to do in planning the event and the significant pitfalls to avoid. Not all ships are created equal when it comes to meetings at sea. We know which ones work well and which ones to avoid. The unique characteristics and construction of cruise ships creates opportunity for the inexperienced or those without extensive knowledge of the cruise industry open to make mistakes that can be costly or negatively affect your event. We provide skilled, knowledgable cruise meeting management to ensure you get the best return on your expenditure and a seamless event that is fun, productive and well run. We work with your key people to ensure we meet your objectives in a timely and efficient manner. • Specialized experience with cruise ship meetings. • Experience in conducting combined cruise ship meeting and incentive programs with companies. 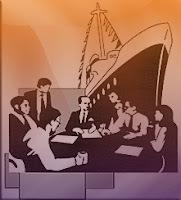 • Extensive knowledge of meeting planning processes and its unique application in the cruise industry. • A commitment to high quality. • A commitment to your success and satisfaction. In addition, we can arrange private group shore events in the various ports as well as customized transportation, both pre and post cruise. Many of our shore side excursions can be tied into team building activities or other themes consistent with your meeting objectives. And if you have disabled participants, we can assist in making their trip easy as well. Thinking about a land based event? Click here to learn more about meetings at all-inclusive resorts.